The ability to design and construct complex optical assemblies is crucial to many experiments that use light to carry information. As requirements on missions become more demanding, so the precision of the sensing apparatus must improve. An advanced technology – hydroxide catalysis bonding – used to join parts together at the molecular level has been adapted at the University of Glasgow to make space flight hardware for the LISA Pathfinder mission. The bonding technology has many advantages over traditional methods like epoxy and optical contacting, and components have been aligned with submicron accuracy. The aim of the proposed project is to secure the UK lead on this enabling technology by demonstrating alternate methods to realise bonded optical assemblies using novel procedures such as mechanised component alignment and bonding, and ground surface active alignment prior to bonding. These advances will result in the technology becoming more mature and at the same time requiring less infrastructure to perform, opening the technology up to become a simpler and therefore more widely used method of making precision sensing hardware, and one that is more suitable to the operating methods of industrial manufacturers of precision optics such as Gooch and Housego. The UK currently has world-leading technical capability in the design and construction of precision-aligned ultra-stable optical assemblies for space flight. This is largely due to heritage from the European Space Agency LISA Pathfinder mission. The techniques developed for the LISA Pathfinder Optical Bench Interferometer resulted in multiple centimetre-scale optical components being permanently attached to a substrate with submicrometre level absolute accuracy, and beams reflected from the components being within a few micrometres and few tens of microradians of nominal. This technology is an evolved version of the hydroxide catalysis bonding process. It was realised that to benefit more fully from this capability further advances to the technique would be necessary. Currently the capability resides within a small, skilled team at the University of Glasgow and involves complex and lengthy operations that require significant support equipment. The technique also relies heavily on the know-how and experience of the operating team. The aim of this project was to mechanise parts of the process and in doing so widen the applicability and use of the technique. There was also potential to further increase the level of control with which components can be located, and considerably reduce the overall assembly time. A further strand of this project was to investigate bonding using ‘ground’ surfaces, i.e. not optically polished, which has the potential to remove many of the constraints that make the current state-of-the-art procedure so specialised, and potentially open the technology to new markets. The project has resulted in the development of a new method of aligning prior to bonding, and crucially, the parts of the process that were previously the most specialised and required manual intervention have been rendered trivial. Gooch and Housego (UK) Ltd were a partner in the project in order to provide expertise, but also with a view to embedding the capability of precision ultra-stable optical assembly construction from UK academia into UK industry. Two optical assemblies were built and environmentally tested: an assembly with polished bonding surfaces using interferometric alignment of surfaces prior to joining, and an assembly with polished-ground bonding. The control of beam alignment during construction for both assemblies resulted in a beam alignment precision of <10 μm and 30 μrad – meaning that this prototype work is already as precise as the current state-of-the-art. 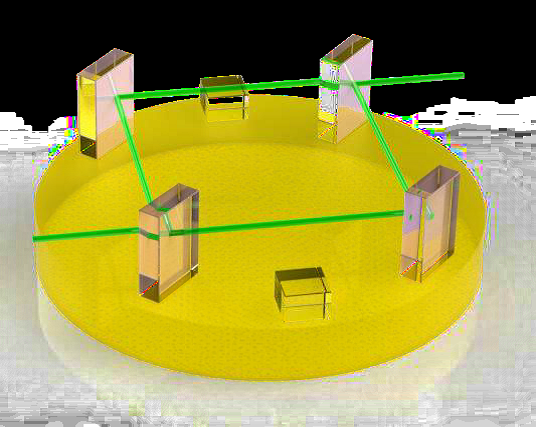 A successful demonstration of optical contacting was conducted using the alignment prior to joining technique, showing the versatility of the technology. This work would benefit from further effort, but already there is potential for new areas to benefit from this technology. The University of Glasgow has commissioned an independent market study for the technology, and will consider patenting an aspect of the work depending on the findings. Considerable knowledge has been generated through this work, both for the academic and industrial partners, and this will provide valuable leverage when pursuing new opportunities to generate impact using this technology.